Mobile workstations will never replace a monster powerful desktop with dual processors and dual or Quad AIBs, and a 1200W power supply to keep all that stuff humming. But if you don’t need, or can afford a monster system like that, then you have some very exciting choices in mobile workstations. We’ve looked at several here in Mt Tiburon Testing Labs, and this week we’re putting the very capable @Xi PowerGo 15/7. The unit comes with a 15.3" screen with of resolution of 1920x1080 in a sculpted charcoal gray clamshell case measuring 16.46×11.10×1.52 in. (W×D×H) inches. It only weighs 4.1 pounds , 5.11 including the power supply, pound for pound the Xi provides the mobile user top flight performance. Inside that chassis is a 2.8 GHz Intel Core i7-7700HQ with 16GB cache, 16GB DDR4 RAM running at 2400MHz, a 512GB Samsung SSD 960 PRO , and a Nvidia Quadro P3000 with 62MB of GDDR5 memory and 1280 CUDA cores. All that for $2499. We compared it to Jon’s favorite mobile workstation, the Dell precision 5510. The 5510 measures 14.06×9.27×0.45 in., and weighs 4.5 pounds with a 130-watt power supply. 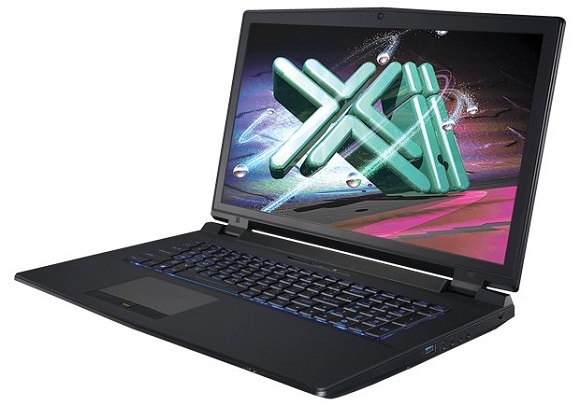 The Dell Precision 5510 comes with a 2.80GHz Xeon CPU E3-1505M v5 processor with 8MB cache, 32GB DDR4 RAM running at 2666MHz, 512 GB SSD, and a Nvidia Quadro M1000M with 2GB of GDDR4 memory and 640 CUDA cores for a mere $2,549 which includes Windows 10 pro. The screen however, is 3840x2160 (Res for SPEC 1900x1060). The two machines aren’t of the same class, the Precision 5510 was released in Q1 2016 so the comparisons won’t be completely balanced. 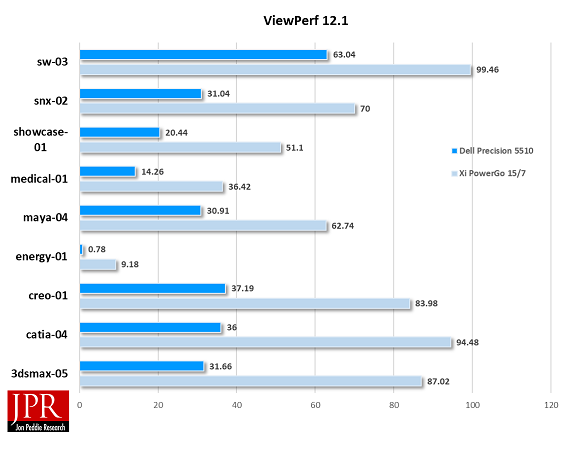 We ran Spec Viewperf 12.1 WPC on both machines and got the following results. The average of the difference in scores was (put your seat belt on)—237%! Now take a second and let that sink in. First of all, the Dell Precision 5510 is an extremely capable and enjoyable machine, and we haven’t found a job it couldn’t do. When you start with that and almost 3X performance, that is an astounding accomplishment. One of the joys of this job is the opportunity to play with and spend some time with some of the worlds most amazing machines. Putting the @XI PowerGo up against the Dell Precision 5510 was a real treat. The Xi PowerGo is an impressive machine, the performace that OEMs are able to squeeze into these thin form factors is truly amazing. In the future JPR is going to add another "P" to the Pmark for laptops, P for pounds. It doesn’t take much imagination to realize that any machine that can deliver almost 300% the performance and 32% better Pmark than a machine that is a year order is an excellent price-performance value.